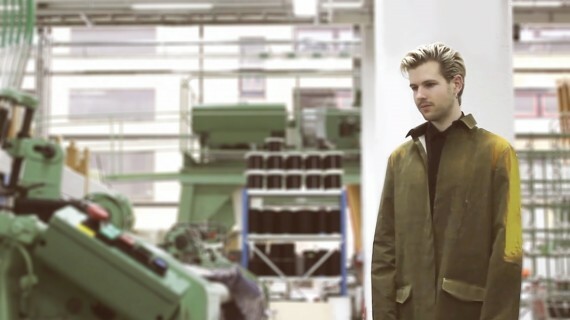 We’ve taken on the challenges of wearable tech and re-imagined the classic work coat. In order to make it truly wearable we believe the tech should be invisible. In this case, the work coat is an example of how clothing can react to the input of noise levels. The coat’s colour changing behaviour communicates a warning that the worker is being exposed to loud noise over a period of time. Anything above 90 dB for longer than 1 minute can cause permanent damage to hearing. The wearer is a textile factory worker supervising the weaving machine. His job is to check on the machines periodically and he has become accustomed to the noise. The coat alerts him of the dangerous environment and he needs to put on hearing protection. It also works as feedback that the machines are running, and signals to the factory boss peering through the window that his employee could be suffering. Our prototype was sewn from thermochromic fabric (developed at the university by textiles student). We tested it by sewing conductive thread throughout and programmed a micro-controller to use noise levels (mic) as input. We imagine this concept to be applicable to other user groups such as construction workers on the street, concert goers and sports fans.